Mary Cyr addresses the needs of researchers, performers, and informed listeners who wish to apply knowledge about historically informed performance to specific pieces. Special emphasis is placed upon the period 1680 to 1760, when the viol, violin, and violoncello grew to prominence as solo instruments in France. Part I deals with the historical background to the debate between the French and Italian styles and the features that defined French style. 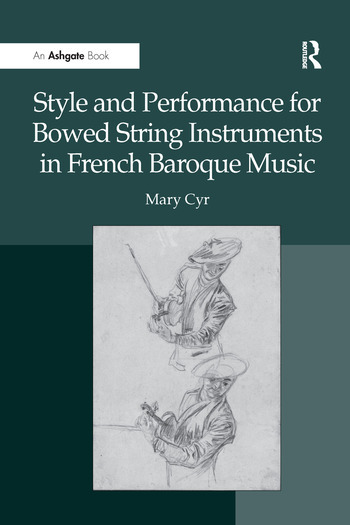 Part II summarizes the present state of research on bowed string instruments (violin, viola, cello, contrebasse, pardessus de viole, and viol) in France, including such topics as the size and distribution of parts in ensembles and the role of the contrebasse. Part III addresses issues and conventions of interpretation such as articulation, tempo and character, inequality, ornamentation, the basse continue, pitch, temperament, and "special effects" such as tremolo and harmonics. Part IV introduces four composer profiles that examine performance issues in the music of Ã‰lisabeth Jacquet de La Guerre, Marin Marais, Jean-Baptiste Barrière, and the Forquerays (father and son). The diversity of compositional styles among this group of composers, and the virtuosity they incorporated in their music, generate a broad field for discussing issues of performance practice and offer opportunities to explore controversial themes within the context of specific pieces. Mary Cyr is Professor Emerita of Music at the University of Guelph, Canada.